What’s the best fertility treatment for PCOS? If only there was a universal answer! But research is getting closer to more successful options like IVM and Letrozole (Femara). Letrozole is a medication intended for treating early stage breast cancer and to keep the breast cancer from returning (source: WebMD). They found that Letrozole had a positive affect on ovulation and less side effects than it’s counter Clomid. 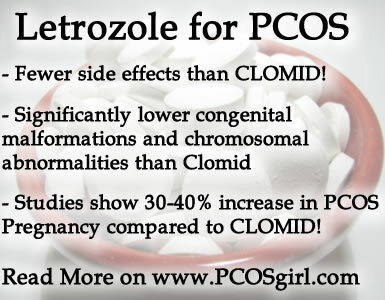 Letrozole for PCOS infertility has increasingly been prescribed to PCOS patients since the early 2000’s. Letrozole has also been prescribed to patients suffering from Endometriosis. A more detailed ovulation induction follow-up study found that Letrozole, compared with a control group of Clomiphene, had significantly lower congenital malformations and chromosomal abnormalities at an overall rate of 2.4% (1.2% major malformations) compared with Clomiphene 4.8% (3.0% major malformations). …the results of a study that began in 2009 at seven research locations—including one in Denver—proving that the drug Letrozole is 30-40 percent more effective than the previous gold standard drug used to overcome the infertility effects of polycystic ovary syndrome (PCOS). The entire article can be read here CU Fertility Clinic’s Breakthrough Research Affects Millions. This is exciting news! Personally I’ve struggled with Clomid- really harsh side effects and no success with it. 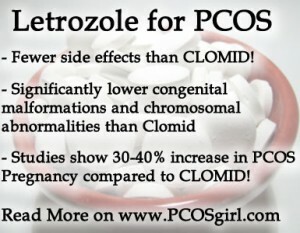 Hoping that Letrozole can bring little bundles of joy to all my PCOS gals out there that are ttc! Letrozole carries the same risks as other fertility meds like Clomid and are not for everybody, talk with your doctor and research away! This entry was posted in PCOS, PCOS Infertility, PCOS News & Research and tagged clomid, infertility meds, pcos infertility, pcos news. I know this is an old post, but i personally had success using femara! The first time on it at a low dose, it did not work. But the next month with a full dose it worked!!! My daughter is now 4yrs old! Don’t lose hope! It can happen! Did you do it daily on your ovulating days.. because me and my husband couldn’t do it daily.. it is so hard because we are both tired from work especially my husband he drives everyday for 2 hrs to get home… We are frustrated… 😢☹️ It is difficult we’ve been trying for a year now..
Are you taking Letrozole alone or doing Letrozole with IUI? That’s such a bummer!! I’m supposed to start Letrozole in a few months!